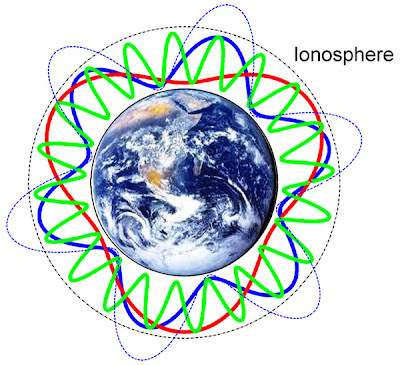 It may sound strange - and so it did to scientists, fr they too for the first time, detected earth's heartbeat from space, a phenomena called the Schumann resonance. What has been discovered is that "Lightning flashes in the skies above the Earth about 50 times every second, creating a burst of electromagnetic waves that circle around the planet's atmosphere. Some of these waves combine and increase in strength, creating something akin to an atmospheric heartbeat that scientists can detect from the ground and use to better understand the makeup of the atmosphere and the weather it generates." This detection was surprising because the resonance was thought to be confined to a particular region of the atmosphere, between the ground and a layer of Earth's atmosphere called the ionosphere.